Backup4all protects your valuable data from partial or total loss by automating backup tasks, password protecting and compressing it to save storage space. You can easily backup to any local or network drive, backup to FTP (with support for SSL encryption, proxy server, passive mode), backup to CD/DVD, or other removable media (such as USB drives). There's a free version which is easy to use (possibly to easy). VeeAm claims the full version is used by over 100K corporates. Why hasn't this put ALL the simple backups out of business? The best backup software. For those of us who know how to use the ribbon interface, it's no problem. Been using since v3 and have only had good results. Version 4 was good but the new ribbon interface ruined it despite the new cloud features. This is a best pay backup software I've ever seen. It has the most amazing set of options, it looks slick and beautiful (the gui I mean), and it's constantly maintained. This is #1 in my backup book. #2 is SyncBack Pro btw. It is much better now, this build is almost perfect. I`m using this sw aprox. 2 years. Previous version was working realy fine. In version 3.3 I`m still reporting some bugs, but the support is not able to fix them. Quite often I have to build backup from scratch, it`s the only solution for my problems (eg. program is doing full backups instead of incremental, is skipping some files for the backup, can`t merge backups, crash during backuping etc.). Absolutely top quality software. Been using it a couple of months now and it has never failed me. Easy to configure but still lots of usable options. Tried a lot of backup and mirroring software but this one I bought. It will be interesting to see which backup program adds 7z compression to its core over zip. Backup4all's latest version is very fast. I've been using DirSync lately for backups, and even though I'm not a fan of the ZIP format, it's impossible to find fault with Backup4all because its developers seemed to have thought of everything. Once you get accustomed to using it, you will love it. 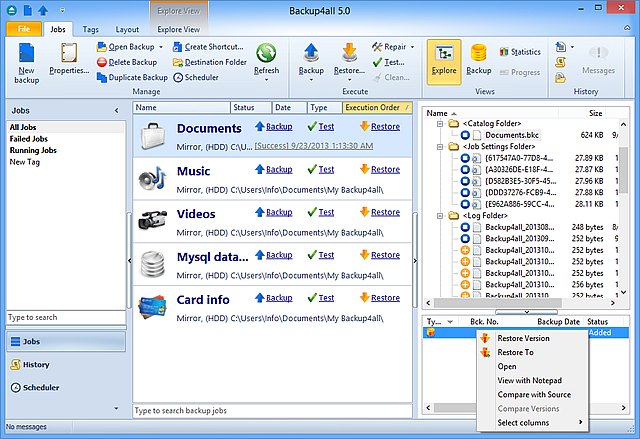 This backup program is the best tool of its kind ever used before. A real professional solution. Another great Backup4All update. With latest version, Softland shows that they listen to their customer's requests and comments, something really appreciated today. Backup4All remains one of the best data backup solutions, for everyday needs. The first detractor to Backup4All is what all backup managers rely on: archiving with .zip format. Over the years I've suffered the occasional corrupted zip that could not be repaired, and we know what pain that brings — so now I have to backup my backup?! Although I recommend Backup4All, I simply use WinRAR to create backups and it has never failed me. The second detractor is its price. Seems like most shareware is creeping up, but primarily shareware authors who market mono-functional applications should never charge more than $25-30. Exhorbitant prices invite piracy. Still I like Backup4All! Great data backup application. I like advanced backup profiles, speed of compression and internal CD/DVD capabilities. Professional version is really pro-class and best of all it creates trusty backup sets. I use Backup4all Classic Edition which costs only $30. Just checked and the discounted price of Genie Backup Manager is $50. Upgrade from Genie Backup Manager 4.0 to GBM 5.0 costs $25. Only the email backup programs have free upgrade policy.